A new book called What Dwells Within is about haunted dolls. It’s subject that has always intrigued me because I've amassed a collection of dolls over the years – some of which you can see in the photo above. A few I have owned since I was tiny, some have been given to me by loved ones, and they all have sentimental attachment. 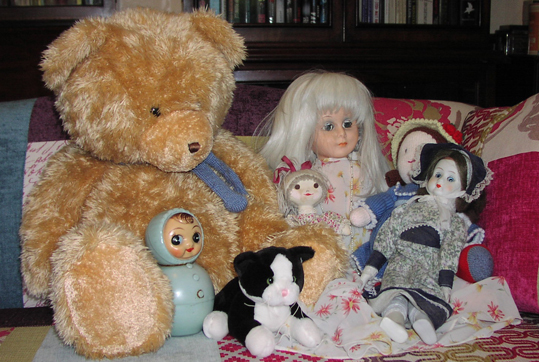 None of my dolls are haunted, as far as I know, although I like to think some of them have their own personality. Actually, according to What Dwells Within, “haunted dolls” isn’t really the correct term – and neither is the more scary “possessed dolls”. The correct term is spirit attachment, hence the book’s subtitle: A Study of Spirit Attachment. What is spirit attachment if not the very definition of a haunting? It is believed that ghosts haunt areas that the deceased were either fond of or met their demise within, and there are countless volumes dedicated to the documentation of haunted places and the history behind each alleged ghost... If a spirit can attach itself to a place that it once shared a connection with, then why not an object? Why not a favoured item of furniture, artwork or a piece of jewellery? If – like many paranormal enthusiasts believe – a building can record the energy or emotions of an individual and replay that incident at a later date (more commonly known as the stone tape theory), why is it improbable that a wedding ring could hold the essence or emotions of the person who once wore it? What Dwells Within, is a study of such items - mostly dolls, but also jewellery, a gypsy fortune-telling mirror and a box supposedly used to trap a malevolent entity. But dolls were what originally interested Jayne and for many years she ran a service called Haunted Dolls through which she bought, researched and then sold dolls with spirit attachments. That has since become HD Paranormal Research Ltd, which investigates a wider remit of potential cases. The book explains the difference between spirit attachment and possession. Possession is when an entity or spirit takes over a person or thing in order to completely control it, but Jayne explains, "Spirit attachment that involves an object relates more in terms of residual energy with elements of individual intelligence remaining after life has expired." The way I prefer to look at it is, if someone hijacks your car, that's possession, if someone hitches a lift in your car, that's attachment. After giving historical examples and explaining how Jayne investigates dolls, the book offers a plethora of case studies. These include pictures of each one, its past, what was revealed when it was studied, and details of the doll's current location and owner. Occasionally, if the item has a dark or dangerous energy, it is contained or destroyed. Jayne says most spirits are not dark, they are simply people who have chosen to remain on the earthly plane after death. They do not wish to harm people, they just want to continue to experience the world or to watch over people they are fond of.